You'll be £19.99 closer to your next £10.00 credit when you purchase Fortress Falklands. What's this? The oil discoveries have fuelled Argentina's ambitions to take the Islands that they believe were stolen from them almost 180 years ago. Buenos Aires is making the 'Malvinas' a regional issue involving other South American countries, and has established an economic blockade of the Islands, virtually cutting them off from the continent. It is a policy they say they will continue until London agrees to discuss a transition to Argentine rule. In response, the Prime Minister has stated that Britain will support the Islanders' right to remain British. The author was born in the Falklands, and returned there to see for himself the profound ways in which his homeland has changed. He considers what islanders have gained and lost, the challenges they face and why they may soon be at the centre of another South Atlantic crisis. 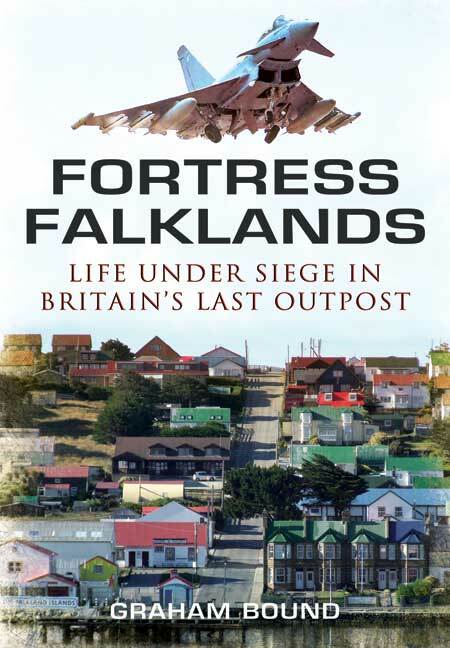 As I read Graham Bound’s Fortress Falklands, the author regularly bemoaned his lack of access to the British military command and the RAF’s Mount Pleasant facilities, which also serve as the Islands’ international airport. It’s not as if Bound might be an Argentine agent – Falklands-born, though he now lives in London, he’s served as a military correspondent for the BBC and has worked in far riskier environments such as Afghanistan. Certainly he has the credibility to make judgments on the Islands’ defenses without giving away any confidential material but, as the sensitive 30th anniversary of the Argentine invasion approached, he apparently got stonewalled and had to rely on retired military and his own online research for that specific topic. That’s unfortunate, but it barely detracts from a book which, despite a rather sensationalist subtitle (“Life Under Siege in Britain’s Last Outpost”) focuses as much or more on a distinctive people who have inhabited their insular homeland for up to nine generations. In fact, he is one of them, descended from a family that arrived in the 1840s; he founded Penguin News, the Islands’ only newspaper, and there’s probably nobody better qualified to present an insider’s viewpoint while simultaneously providing an outsider’s critical observations. At the same time, he even-handedly discusses both the achievements and weaknesses of local society, where the standard of living has risen dramatically since the 1980s but, while some local entrepreneurs have earned previously unthinkable fortunes and unemployment is virtually non-existent, there is still a notable economic inequality. Until the recent selection of Pope Francis I in Rome last week’s Falklands referendum in which Islanders overwhelmingly affirmed their desire to continue as a “self-governing British territory” made huge headlines in Argentina, where president Fernández and her administration went out of their way to dismiss its legitimacy – to the point of declaring that Falkland Islanders did not even exist. In his book, Bound stresses Islanders’ concerns that Argentina will continue to make things difficult and could even take military action; certainly, the Argentine government is deaf to the worries of a people who were outnumbered at least five to one during the 1982 occupation. Graham Bound's Fortress Falklands is about a possible future conflict not just in the Falklands but in the whole southern Atlantic. Graham Bound is a Falkland Islander. In this book he returns to his roots to find out whether the islands can survive not just the economic sanctions, but also the dramatic changes in their way of life. His accounts of the fauna and flora, as well as the fishing, are told in a compelling plain style.This book should be read for the feeling of the relics of empire as mush as the military threats in the deep south. If the region is as unpredictable as the author indicates, and if the whole thing does blow up, it is useful to know about the people and lands for whom the British Treasury may once again expend so much blood and treasure. Bounds review of the success of Falklands' commerce, especially the squid and fishing industry as well as tourism and oil exploration, is comprehensive and explains why the local economy today is healthy, if delicately balanced. This is a well written, and timely publication. I have enjoyed reading Graham's new book. I think it adds something to the debate about the future of the islands. He has produced an excellent, easy-to-read, right up-to-date portrait of the Islands, combining his extensive experience and contacts in the Islands, South America and UK with detailed interviews with key entrepreneurs, decision-makers and opinion-formers, as well as Argentine war veterans and political thinkers. He presents a fascinating account of Island life in all its complexity, both the attractive and the less so. The book is understandably partisan yet, intriguingly for me, it is more objective that I expected. It is a book which both Argentine and British politicians would do well to heed. The thirty photographs significantly add to the content and attraction of the book, though half have a military element. Graham Bound casts a fascinating spotlight on a worrying situation in the South Atlantic. He (the author) returns to his birthplace to comment on how the Falklands have changed in the last 30 years, especially following the discovery of oil, the challenges islanders face and the continued threat of invasion. I found Fortress Falklands a top read. Though he now lives in west London, Graham, now 54, returns to his homeland often, and although he sees a very different place now to the forgotten outpost he lived in back in 1982, one thing hasn't changed: the sovereignty dispute hasn't been resolved. Argentina have never renounced their claim and tensions have risen in the past few months, with Argentine president Christina Kirchner dialing up the rhetoric and sabre-rattling, as well as imposing what Graham describes as "a very nasty economic and diplomatic offensive" which has included restrictions on flights and shipping to and from the Islands. "It really feels like a siege down there," says Graham. Pick of the month. Timely and very readable. A book published this week in Britain takes an in-depth look at the Falklands Islands 30 years on from the short but deadly conflict of 1982. Graham Bound was born in the Falkland Islands, where he was the founding editor of the local newspaper, Penguin News. Although now living in London, he still contributes a regular column to the paper. 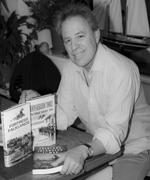 He was living in the Falklands at the time of the 1982 invasion, and that experience led to his first book for Pen and Sword, Falkland Islanders at War. Based on over 100 interviews with Islanders and combatants from both sides, the book tells the story of the invasion, occupation and conflict from the point of view of the local population. The book was subsequently updated considerably, and republished by Pen and Sword as Invasion 1982. Graham moved to the UK in 1992, where he worked as a broadcaster with BBC World Service Radio and as a freelance writer. He was an assistant editor on Soldier Magazine, and reported from operational areas around the world, including Iraq and Kosovo. He later became a senior information officer at the MOD, where he was Editor of the MOD publication Defence Focus. His last MOD post was to the Cross Departmental Afghanistan Communications Team, which coordinated communications strategy around Afghanistan for Number 10 Downing Street. He has now returned to private freelance work, and recently went home to the Falklands to research and write Fortress Falklands – Life Under Siege in Britain's Last Outpost. This is a frank assessment of the threat still posed by Argentina and the remarkable changes that have taken place in the islands – not least the discovery of oil – since 1982. In his spare time, Graham spends time at his remote cabin in the Falklands, sailing in warmer seas than the Falklands can offer, and walking his cockapoo dog Booboo.